Created, designed, and built by Nikolai Zykov in 1994. First presentation - September 1, 1994, Zvezda Concert Hall , Narofominsk, Russia. 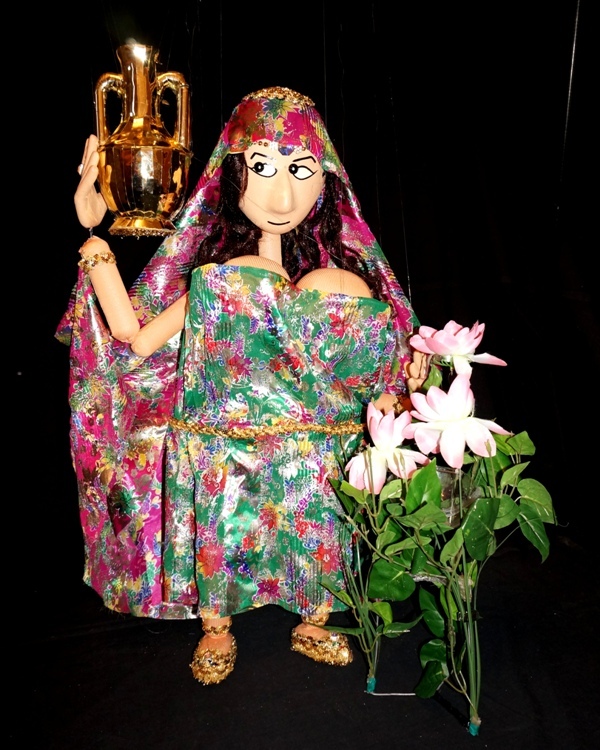 TTUNISIAN BEAUTY - multifunctional trick marionette with illusions: appearing of real water in empty pot, opening of the flowers after watering. The puppet has moving side to side eyes and breathing chest. Step 1: dance of the puppet with a jag on her head. Step 2: the Beauty tries to water flowers, but the jag is empty. Step 3: the Beauty goes to the spring to take water (pantomime). Step 4: the Beauty waters the flowers with real water. Step 5: the flowers come out.